Scholten Surgical Instruments has over 30 years of Medical Manufacturing Experience. Scholten Surgical Instruments introduces the all new Novatome single-use disposable Endomyocardial biopsy forceps. Scholten Surgical Instruments is alwaysTrusted for its uncompromising quality and reliability. A Endomyocardial Biopsy Forceps design proven by over 30 years of successful use. Now in a disposable format! A perfect balance of flexibility and stiffness. 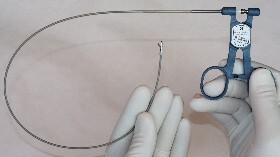 The Novatome™ single-use bioptome, like its predecessor the Reusable Bioptome, has set the standard for ease of positioning with a perfect balance of shaft flexibility and stiffness in conjunction with superior torsion control for optimum feel when navigating through the tricuspid valve into the ventricle. The unique single action cutting jaw maximizes sample size while minimizing tissue compression preserving sample quality. 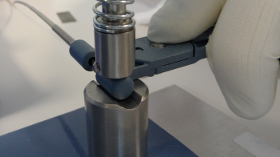 Our jaw sharpening geometry and precision alignment produces exceptional cutting performance without tearing. With the new Novatome™, Scholten Surgical continues to provide performance and value. 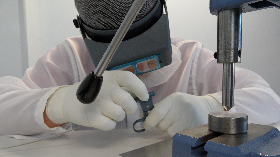 All Components are manufactured and processed by our highly trained clean room assembly technicians. Manufactured and assembled in USA. Looking for the Scholten Reusable Bioptome? Click Here for information. Positioning of the bioptome for endomyocardial biopsy. 1, Bioptome is inserted with the tip pointed toward the lateral wall of the right atrium. 2, At the level of the mid-right atrium, the bioptome is rotated anteriorly approximately 180 degrees and is advanced through the tricuspid valve apparatus toward the right ventricle. 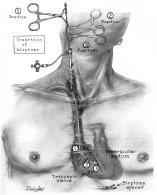 3, The bioptome is advanced through to the interventricular septum with the jaws opened. Illustration: WA Baumgartner, Heart and Lung Transplantation, 2nd Edition, p.273; Copyright Elsevier, 2002. The latest Scholten disposable Bioptome model is called the Novatome and, like its predecessors, is specially designed to acquire maximum specimen size for more accurate pathology results. With a reputation for its ease of positioning and heart rhythm feedback, Scholten Bioptomes have earned high praise. Where is the Reusable Bioptome?